Lakeville Executive Suites works closely with all the major brokerage firms in the south metro Minneapolis area. Our business center offers a range of fully furnished & equipped offices, giving your clients a low-risk and immediate entry into an office space. Below please read about how our location can benefit both you and your clients - along with some commonly asked questions. I look forward to working with you and feel free to e-mail or call me if you have any questions. How do I explain Lakeville Executive Suites to my client? Lakeville suites provides companies with competitively priced office space with flexible lease terms to meet their business needs. Clients can choose their office space (based on availability) and length of agreement with a 6-month minimum lease. Everything is in place to ensure clients are productive from day one: telephone lines and equipment, secure high-speed Internet access, furniture and more. There is no up-front capital expenditure, so clients save money and conserve cash flow. Close deals quicker. Our deals close fast because the clients are in control. All leads followed up within 24 hours and updates are sent back to you. When should I recommend Lakeville Executive Suites to a client? Lakeville Suites is best when your client requires office space for 1-3 people, and don't want the up-front cost of opening an entire office space. Most times Lakeville Suites offices are less expensive than your client's next best alternative. What make Lakeville Suites different from other competitors? We offer all inclusive pricing. Our quoted rent rate includes office space, furniture, telephone, internet services, access to all meeting rooms, work room, and kitchen area and beverage services. Is Lakeville Suites only short term? No. Clients choose the term to meet their exact business needs. Some clients choose a 2 year term, others 6 months. Your clients call it the "right term". How do I compare office pricing to square foot pricing? We will work with you to run your client through our cost analyzer. The cost analyzer clearly identifies all the costs involved in setting up an office. The difference between square feet and total occupancy (or per person) costs will be made clear to your client. Is Lakeville Suites easy to do business with? Yes. Working with Lakeville Suites is easy and predictable. The sales process and product offering is the same each time you do a deal. To refer a client simply fill out an on-line form, e-mail us or call. All it takes is one phone call or e-mail. And Lakeville Suites pays commissions within 30 days. What commission do you pay? 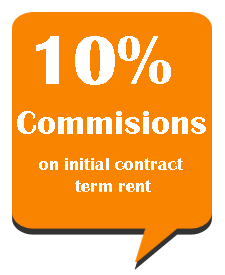 Our standard fee is 10% on the initial contract term rent. Please feel free to download our marketing flyer. If you have any further questions do not hesitate to call or e-mail us!